A piece of clothing is more than just fabric, stitches and marketing – at least in the eyes of Eileen Yap, founder of homegrown fashion label, Noël Caleb. We are stoked to have the honour of this interview and feel paiseh that we have have her take time out from her busy schedule. So, we chatted like two schoolgirls over kopi and teh-C to learn how this rising brand started and her hopes for Noël Caleb’s future. With 15 years of working experience in Saatchi & Saatchi, research companies and a marketing consultancy firm, this lady has dipped her fingers into dealing with brands such as Tiger Beer, Singapore Tourism Board, P&G, Nokia, Colgate Palmolive to name a few. Managing clients, conducting focus groups, surveys and scaling analytics run at the back of her hands. Like myself, you’re probably curious how a marketing specialist with a wealth of experience in consumer brands stumbled into carving a new path in seemingly unknown grounds. We know that it isn’t easy to build a brand from scratch, much less a fashion label plus almost zilch experience. Her wish was to design and develop her own line of apparel and these clothes would touch the lives of people. This intrinsic belief helped channel her purpose with the inner thanksgiving spirit which Noël Caleb stands for. “The brand encompasses people who love fashion to be part of it. Our designers help to create the pieces and we bring fashion lovers together to get involved in all things related to fashion. You may be a fashion blogger, an accessories label owner, enjoy sewing or love organizing events; fashion should be inclusive and that’s how we share the same passion, with fashion as the by-product.”, shares Eileen. Putting heads together to conceptualize fresh designs. Her ideology is simple: If you love fashion, you can be part of the community. This year marks the first Mentorship Program which Noël Caleb embarked on. Best of all, you don’t need to have certain “qualifications” to try out, so that opens up new opportunities if you have been wanting to design or work in the fashion industry. Those who have always wanted to do the runway, a chance to model the brand’s clothes with their Model Search where you get to learn how to strut the lovely pieces like a pro (almost!). The Apprentice Program was so well-received – aspiring designers get a chance to launch their very own collection, which is what the Jonah designers can attest to. Each collection (There are 4 others besides Jonah; Ballerina Diaries, Honey in a Rock, Teddy Girls and Garden of Eden) is different, but yet equally versatile for the modern women and very wearable. A true hands-on experience from first sketches to seeing your work come to life and being worn by a “real” person (not some supermodel) during the runway events that Noël Caleb organizes, is a boost of morale. In fact, one of her customers loved the Teddy Girls collection so much, she wants to have her wedding outfits (including her groom’s!) spiral from them! 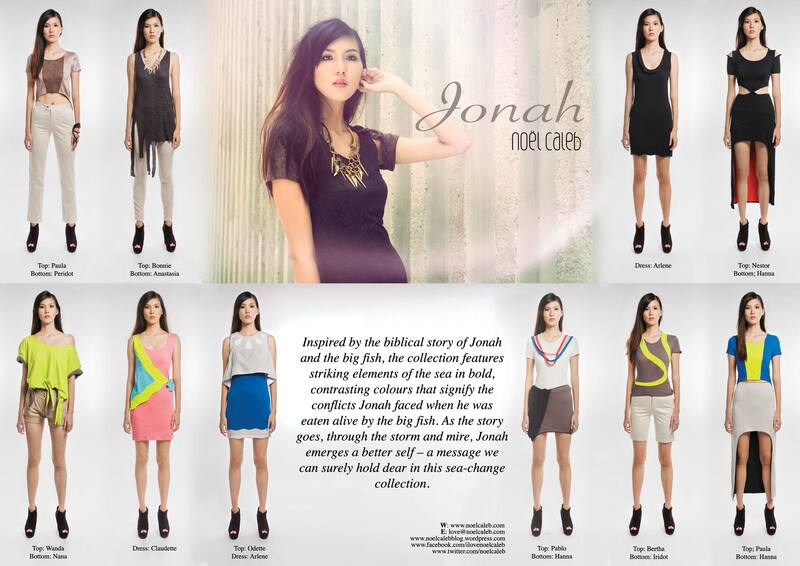 Jonah collection… which is your fave piece? Talking to Eileen makes you feel like you’re catching up with a new old friend (maybe because we are both marketers too? Haha!) She’s one who has her own mind and knows what she wants. Her gentle demeanour belies her strong spirit, which probably drove her to take up this challenge which became a turning point in her life. It is also her personable nature which has helped the brand grow – believing strongly in personalized service, customers continue to come back for more and help to spread the word through word-of-mouth. Fitting sessions are arranged at the convenience of customers and most ladies usually bring a friend or 2 (with their kids in tow; and Eileen helps to babysit while mummies have some time to preen in front of the mirror) to help each other see if they look good when trying on the clothes or accessories. Eileen is no pushy salesperson either: if they look good and like what they see in the mirror, they will be happy with their purchases. If the clothes do not flatter a person, she is sure to let them know, than have them regret a purchase. Naturally, Noël Caleb customers make the best brand advocates! “The interaction with customers is important and that’s how we also gather feedback about what they like or don’t like about the clothes. It’s a value-add service; it’s not just about selling but also the human touch which sets us apart,” Eileen reveals. Having stocked her apparel at major department stores in Singapore previously, she soon realized it wasn’t exactly making business sense for her. Consignment fees, listing fees and not being able to know who actually bought the clothes were not in favour to the plans. After pulling out, Eileen almost singlehandedly goes forth with fitting sessions through requests via their website. Streamlining the channels has also helped her to be able to pass savings down to consumers – win-win for all! With plans to launch another 4 collections within the year, things look set to be very busy. Eileen humbly counts her blessings of having a wonderful team, supportive family and customers who keep her going. As a mother of 3 young kids (Kayleen, 8; Tricia, 6 and -you guessed it, Caleb, 2! ), I’m obviously bewildered on how she manages her time with such a work schedule plus an upcoming event (we all know event organizing and management can drive people up the wall). She shares insights on how she oozes superpowers without getting a wrinkle in her clothes: “I work around my kids’ schedules and channel my energy to work when they sleep. I also realized that many mums send emails to enquire about our clothes or to fix a fitting session during these witching hours – guess that’s the life of a mum! I’m very thankful for a supportive husband who helps with the kids and his reminders on achieving balance. As a mumpreneur, it’s “mother” first and the mindset not to overwork is important.” She jokes that her lecturer husband says that she’s resilient to stress – guess that’s a catalyst which helps to ignite that inner passion to put on her “happy octopus” costume. Happy faces after Noël Caleb’s Christmas event last year! When asked how she de-stresses, Eileen says she enjoys playing with the kids including spending time on craftwork. Her elder daughter, Kayleen, is also mummy’s companion during the school holidays. When we met for this interview, her independent young lady was happy to play at the playground on her own. When it rained, she came in and sat beside mummy and started scribbling quietly on her own. Through her daughter and the young generation, she hopes to revive sewing, a skill that was traditionally sought-after during the 60s and 70s. She reveals plans on grooming a mentee, a 9 year old who interned at Teen Vogue who surprised everyone with a 100-page worth of shoes and clothes designs sketches. Someday, she hopes the industry is revived with a throwback skill of handsewn pieces, a change from machine-churned clone: A mission that she has set for Noël Caleb to contribute back to the fashion industry and people who appreciate fashion. With big plans for this up and coming brand, we can’t help but feel proud of its success so far. Not one to rest on her laurels, Eileen has been burying her nose in preparation for the launch of their Mirror Collection as well as the graduation ceremony for the Mentorship Program. In fact, the program line-up involves 26 real people models, 2 guests performers and an exciting collection (plus shopping spree!) for ladies! We are excited to see where this brand is headed for, and are definitely looking forward to the new collections. The current ones have already taken our breath away, so do keep your eyes peeled and get ready to be wow-ed! 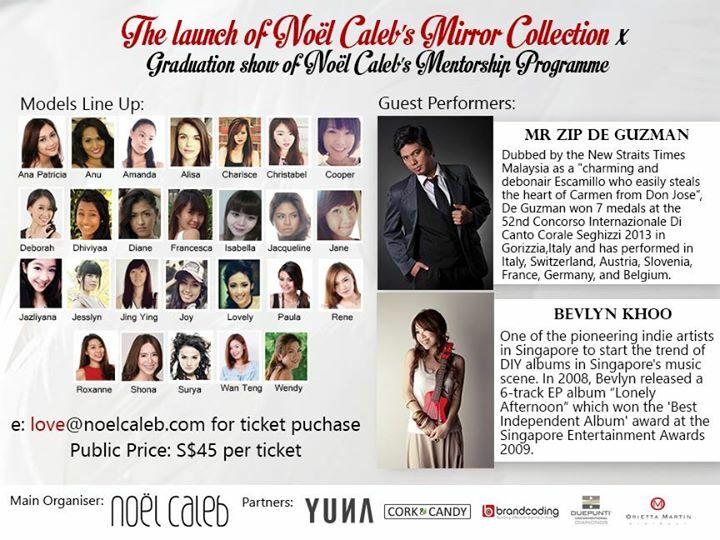 Tickets are selling fast, grab yours by emailing to love@noelcaleb.com and see you on 29 April at Food for Thought, 7 – 10pm!